In a scene from the movie The Matrix, Morpheus shows newcomer Neo two pills. For some of you, deciding to run slower is like taking the red pill. Your choices are taking the blue pill and continue what you are doing, or taking the red pill and opening your mind to what may be some new magical experience. If you are often sore, injured, or moving much slower than you think you should, then go for the red. For running, you need to develop the correct system: the aerobic system. This is the highly efficient system using oxygen, glucose, and fat metabolism to produce energy. The modern analogy is this: each of us is blessed with a hybrid engine, actually billions of hybrid engines, at the muscular level; these are the mighty mitochondria. The electric battery is burning fat — highly efficient, with stores to run for days on minimal added fuel. It is resistant to breaking down. The less efficient but more readily available engine is the gas power, or sugars. We are constantly mixing and we always need some gas in the tank. The proportions of electric and gas shift as the effort and heart rate go up. The harder and faster, the more gas and less electric. Let’s now differentiate aerobic vs. anaerobic and the differences with each system. Both produce adenosine-5′-triphosphate (ATP), allowing muscle contraction, but there are critically important differences. Most understand the anaerobic because we feel it. Explosive exercising (sprinting) with pure anaerobic respiration produces six to 10 seconds of immediate energy with ATP and creatine phosphate stored in the fast twitch power muscles. No oxygen is needed, but contractions stop after 10 seconds. If you lower the pace to a hard effort you can sustain for only one to 15 minutes, you are still above the anaerobic threshold (AnT). You are demanding ATP faster than the system can produce it aerobically. You use muscle glycogen and lactate as fuel, but the hydrogen ion waste products produce the toxic acidosis. This is not sustainable for longer distances. You produce only two ATP per molecule of glucose and lots of nasty stuff, which accumulates. The aerobic (oxygen dependent) system uses the powerful hybrid engines (mitochondria) at the muscular level. Oxygen is delivered to the engines via a rich network of capillaries (blood). Specific enzymes spark the process. If you lower the pace below the AnT (transition from red to light blue in Fig 1) to an oxygen-consuming zone, you get 36-38 ATP per molecule of glucose— this is gas/sugar power— and somewhat efficiently, as a fit person can store enough sugars to give 90 minutes or so of activity. Now if you slow down a bit more to below the aerobic threshold (AT) (transition from light blue to dark blue in Fig 1), you can develop the network to break down fat into energy. Your efficiency jumps exponentially to over 400ATP per triglyceride molecule! This is electric power. If you have ever driven a Prius, you benefit from the subtle mixing of gas and electric, which you cannot detect as the driver. Your body is doing this all the time in exercise. You want more efficiency … generate more electricity! Any activity lasting more than a couple hours is largely electric. Many of us are running too hard daily and constantly using and replenishing the easily accessed sugar stores. When sugar levels drop or we create acidic waste anaerobically, we crash. Mind and body sense an overwhelming fatigue. Topping off this tank with more sugar at high levels of exertion is problematic. Blood is shunted from the gut to the active muscles. Even if you do force down calories, what you eat tends to sit in the gut, or worse you toss it back up. When this occurs you have options. Walk, try to recover, and refill your tank a bit. Or take the more comfortable option and call it a day. Even worse is when unfit athletes who have not built the aerobic system shift quickly into anaerobic mode as they cannot deliver oxygen to the system. In essence, they have few roads (capillaries) and few aerobic engines (mitochondria). To constantly access the deep fat burning tank you must train correctly and eat correctly. Some added glucose is still important, but we are most efficient in hybrid mode with the majority of the power coming off electric (fat burning). So how do you build the mitochondria in your muscles, more aerobic enzymes, and more capillaries so your hybrid engines are at optimum performance? Your goal is to build a bigger engine- build billions of mitochondrial factories and the capillary blood supply to deliver the oxygen to them. The heart and lungs are the fuel pump, the engines are the billions of fat and glucose burning mitochondria in the muscles. The good news is that it is all about running ‘easy’. For most highly motivated exercisers, the definition of easy is not uniform. What level of effort is easy to build and enables you to use the aerobic system? How can you assess this yourself? The pioneer in this field was New Zealand’s Arthur Lydiard, who trained the best middle distance and distance runners in the 1960s. His system is based on months of aerobic training, followed by measured increases in intensity as events approach. His principles still apply in almost all modern training. Lydiard’s runners were taught what ‘easy’ was under the master’s eye. 800-metre specialists were running 22-mile-long runs and 100- mile-weeks in their base phase. Why? To build a massive and resilient aerobic system, on which everything else later would be built. Lydiard’s runners always started their build part of the pyramid with lots of easy aerobic runs, mostly in happy fat burning zone. This aerobic threshold is the fine and mostly undetectable line where you are converting from more efficient fat energy to the more accessible glucose energy. The former has limitless supply, the latter good for about an hour or two. Paradoxically, training these fat-burning engines produces the rich capillary pathways that allow glucose to be used more efficiently too when it is needed during faster running. 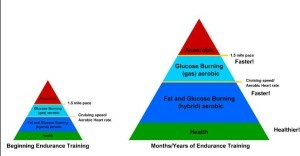 As the training pyramid progressed toward a season, harder aerobic runs closer to the AnT were performed. The runners now had the aerobic capacity to perform these runs. They did not eat before or during the longer runs, and through this method, and glycogen depleting much of the slow twitch fibres, the runners began capillarising and building factories in the fast twitch aerobic fibres — essentially doing speedwork without the toxic by-products, and further increasing the aerobic capacity. On the nutrition side, they did fill the tanks heartily after these endurance efforts with real New Zealand farm food. With six weeks before the key races, it was time to enhance the anaerobic system required for tolerating oxygen debt and acidity in events that were performed at efforts above the AnT. We have a limited capacity to endure this debt. With huge aerobic capacity, Lydiard’s runners were able to run at faster speeds for longer durations without accumulating acidity and oxygen debt, and thus accelerated from the field at the bell lap. Another master of this technique is Mark Allen. He describes his evolution to this method on his website.Mark tried to finish each and every run all out. After seasons of inconsistencies and fatigue, he soon discovered that running harder and harder was not the answer. Skeptical but curious about Phil Maffetone’s lower effort training, Mark put a heart rate monitor on, and at a pace of 8:15 per mile his HR monitor would beep at the preset 155. This was slower than he ever ran. Convinced to take the slow burn approach he took months and ran at 155 HR. During these months he became more efficient and faster at the low heart rate. Before his epic victory over Dave Scott in the 1989 Ironman, he was running effortless 5:30 miles at this easy effort. Mark Allen went on to win six straight Ironman titles. But what Mark relays to his audiences is that before embracing these methods, he lost six straight Ironmans to Dave Scott. In 1989, he not only beat Dave Scott, but beat him on his best day and won by 58 seconds, taking 18 minutes off the Ironman record. Priscilla Welch won the 1987 New York Marathon at age 40, a feat likely never to be repeated. She took up running as recreation in her 30s. Priscilla was a master of efficiency, with 10K times only a trace faster than her marathon speed. She pioneered the Maximal Aerobic Function Test. Priscilla was a believer of the powerful feedback of the Heart Rate monitor. In her build up for races, she did the bulk of her training below HR 150. She would not exceed this, even if it meant walking up a hill. She would judge her fitness not by a time trial (all out effort over a distance) but by the MAFT. Her HR was set to go no higher than 150 and she would measure her time over a five-mile course. She knew she was aerobically fit when she hit her goal times at the easy effort. These experienced athletes and coaches also understood that mixing in hard anaerobic work during the aerobic building phase inhibited aerobic development. Many athletes are constantly doing cycles of high intensity intervals, week in week out all year long, and find themselves fatigued, injured, or lacking joy in their life and activity. Aerobic running is the happy zone, where the runner’s high exists. Very short six- to 10-second sprints can be done all year round, in order to develop biomechanical efficiency and improve movement patterns. These short bouts do not produce the damaging acidosis. a. If you have or are recovering from a major illness (heart disease, any operation, any hospital stay) or on any regular medication, subtract 10.
b. If you have not exercised before, you have exercised but have been injured or are regressing in your running, subtract 5.
c. If you have been exercising for up to two years with no real problems and have not had colds or flu more than once or twice a year, subtract 0.
d. If you have been exercising for more than two years without any problems, making progress in competition without injury, add 5. For example, if you are 30 years old and reasonably fit you would fall into category 2c: 180 – 30 = 150.This is your maximum aerobic heart rate for base training. For efficient base building, you should train at or below this level throughout your base period. To summarize what all this means for you as you start or develop your program. A few of us have good cues to what true aerobic pace is and can run in this happy and efficient zone without the feedback of a monitor. Others of us are more hard chargers (Type A) and need a feedback tool not to help us speed up, but to slow down. It takes years to fully build the aerobic system. Only when your event is nearing is it wise to add anaerobic work. 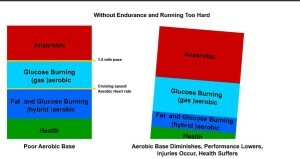 Doing anaerobic work too early can lead to burn out and injury and inhibit aerobic development. There are no short cuts or six week plans. Building the Electric Engine. Achieving You Maximal Aerobic Fitness through Proper Heart Rate Training. My example at age 45. There are many ways to determine your aerobic training zone from a wide variety of methods. I’m going to explain some of the more popular ways of determining your optimal aerobic training zones and give an example for each. 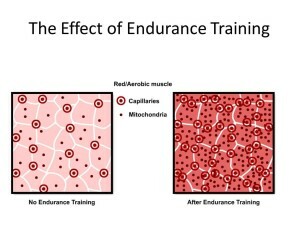 The aerobic training zone is the optimal zone for aerobic development and building the millions of mitochondria, capillaries, and fat burning enzymes to allow for optimal utilization of fat as fuel. This occurs mostly at the muscular level, not in the heart or lungs. Remember each molecule of fat burned produces 400+ ATP (energy units) vs. only 36 ATP per molecule of glucose. For most runners this is around 70% – 80% effort….but what does that really mean in numbers. This would be high-Zone 2 according to the zones that Joe Friel uses in Total Heart Rate Training. In training one might even train at a little lower heart rate just to give some room for cardiac drift (when the heart rates rises at the end of a workout due to fatigue). In order to compare these formulas fairly, I will use my own numbers at 45 yo, running about 50-60 miles a week, no real speed work, and able to run a 2:37 marathon (6 minutes a mile). In this example below realize I am an outlier, having accumulated 100,000 miles of running over 30 years duration and can achieve higher heart rates at Lactate Threshold and Maximum than would be predicted by my age. The most commonly known way to determine your training zones. We have all seen this one: This is wrong half the time, but can be a safe start point for a new runner. 220-age = MHR (maximum heart rate). Exercise Physiologists recommend 70-80% of MHR as a safe aerobic zone. In this example my aerobic training zones would be from 122-140 BPM. This is the method developed by Phil Maffetone. This formula determines your maximum aerobic zone. Athletes such as Mark Allen and Mike Pigg have successfully used this method for base building. This is what I call high end Zone 2. If you workout 3-4 times a week leave the number as it is. If you workout 5 or more times as week and have done so for a year or more, then add an additional 5 beats to that number. If you are about 60 years old or older OR if you are about 20 years old or younger, add an additional 5 beats to the corrected number you now have. Adjustments: I work out 5 or more times per week so I will add 5 beats to that number. Using this method, I end up with a maximum aerobic zone of 140 (High end of Training Zone). Using the protocol in the Triathlete’s Training Bible and from my own personal LTHR tests, I calculated my run Lactate Threshold to be 178. From here I can calculate my Zone 2 ranges. Friel uses the range of 85-89% of LTHR vs. any MHR formula. By real testing at Ken Mierke’s lab my optimum training zone based on where I am most efficient is less than HR of 156. Now where should YOU start? As you can see, there is some disparity in these methods. Some methods are closer than others and depending on your age, some of these flat out won’t work for you. The age – adjusted is wrong half the time, especially in older more fit runners. I’d use either the Friel Method if you are a competitive runner or the Karvoren Method (but finding your maximum heart rate is not a lot of fun and not necessary). The Maffetone method is a great safe start point for a beginner and even for advanced athletes who are plagued by overtraining. My advice is to use the same method all the time, as consistency is your best measuring tool. The Maffetone Method is the safest if you are new to running, a beginner, recovering from an injury, or do not feel fit enough to give a hard 30 minute effort. It is best to be on the conservative side versus push over your true aerobic zone. Now if you are a competitive runner, not having any injury issues, and fit enough for a hard 30 minute effort then the Friel Method is excellent and gives results very close to what you will find in the lab. This correlated almost exactly to a recent VO2 test I had. If you have access to an Exercise Physiology Lab and true VO2 Max and metabolic testing then this will give you the most accurate results. Why do my results suggest a higher aerobic threshold with the Friel and Karvonen methods than my age would predict? I have been running daily for over 30 years and have developed a good running economy and the accompanying large amounts of capillaries, mitochondria, and fat burning enzymes. I can maintain an aerobic pace at a heart rate very close to what most would have as a maximum heart rate at age 45. To measure your progress do a simple and pain free 3 mile MAF (Maximal Aerobic Function Test). Pick an accurate 3 mile route, preferably flat. When you are no longer improving after several months of primary aerobic based training you have built this engine fully! You are faster than ever before at this comfortable effort. You are ready now to top off the speed. Big Book of Endurance Training and Racing and The Big Book of Health and Fitness by Dr. Phil Maffetone. 2 must reads to understand basic aerobic vs. anaerobic activity and ADS (aerobic deficiency syndrome). Maffetone trained Mark Allen, Mike Pigg, and Stu Mittleman….all legends. Principles are great for entry level and high level runners. Large focus on diet. Be healthy, not just fit.